Valentine Anderson was born at Hotham Hill (North Melbourne), Victoria to parents Frederick Anderson and Louise (Heinrichsen). Frederick died when Valentine was two years of age, and he was brought up by his mother from that date. After attending Primary School in Ballarat Valentine Anderson completed an assaying certificate at the Ballarat School of Mines (SMB) in 1904, and was an assistant Chemistry demonstrator at the Ballarat School of Mines (SMB) from 1904 to 1905. He then joined the Chemistry department of the Working Men's College, Melbourne (now RMIT) as lecturer and demonstrator for two years, while also teaching Science at Wesley College. Valentine Anderson practised as a chemical analyst on his own account in Melbourne from 1910, and was partner from 1915 in the firm known as Avery & Anderson, Analysts. An adviser to many Government departments and committees, Valentine Anderson published a number of research papers. 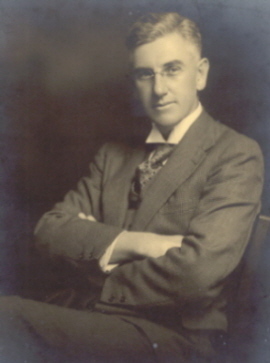 In 1908-9 he took over David Avery's advisory role to the Melbourne and Metropolitan Board of Works, and was analyst for the inspector of explosives. In 1913-15 the University of Melbourne granted Valentine Anderson government scholarships totalling £250 to undertake research from his own laboratories into nitrogen in rain-water. The work was partly sponsored by the British Association for the Advancement of Science, and the resulting report was published, with high praise, in the Journal of the Royal Meteorological Society in 1915. From 1916 Anderson was appointed to the Commonwealth Bureau of Science and Industry and advised the Commonwealth on the availability of potassium from alunite, ash and kelp, on fuel economy, and on setting up the white earthenware pottery industry. In 1920-26 he established himself as a leading consultant in industrial chemistry, an able problem-solver, and an upright honourable man. From 1925 to 1946 he lectured part time in applied chemistry at the University of Melbourne, transmitting his industrial experience to senior students in informative by uninspiring lectures. Valentine Anderson died on 22 August 1969 at Canterbury, Victoria. 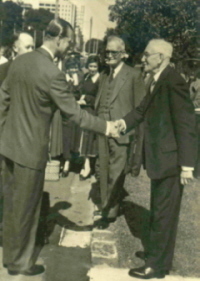 Caption (left) Valentine Anderson meets Prince Phillip.